Why do I need to turn off tree-sitter? As of v1.32.0, Atom has enabled the use of their experimental tree-sitter parsers to parse different programming languages. Unfortunately, there appears to be some bugs that cause certain scenarios to no longer be recognized. One of these scenarios is when your editor cursor is inside a function call. Kite used this information to determine when to show you information on how to call functions, and so when the tree-sitter parsers are enabled, Kite can no longer assist you in calling functions. To disable the tree-sitter parsers, open Atom's settings, click on Core, and then scroll down to the bottom and uncheck the checkbox labeled "Use Tree Sitter Parsers". 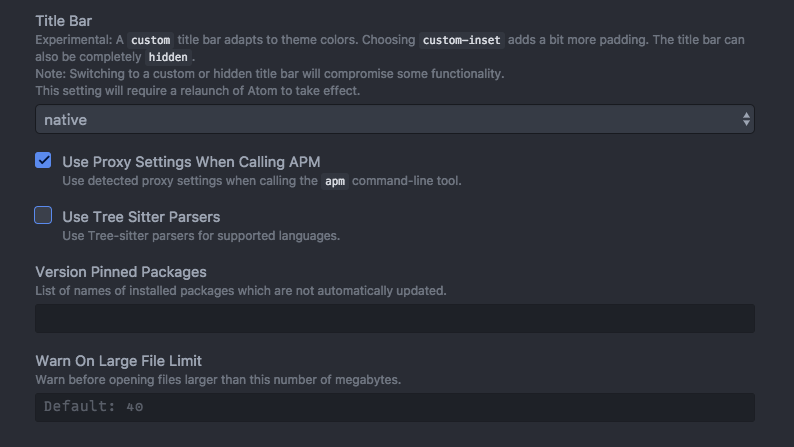 You must restart the editor for this setting change to take effect if you're using Atom v1.32.0 or less. You can also click on the notification that Kite shows you when this setting is enabled. Clicking on this button will restart the editor for you.